Long story short. This anime is a series of cliff hangers that lead you almost no where. The story takes place in a world where some Humans are mutated with a blood infection which turns them basically into Vampires. Vampires get under control, now forced to wear collars that have GPSs. 4 try to rob a bank. Get caught now are in a vampire "hunger games" featuring monsters. They gotta live. I mean it's all pretty straight forward. Then you see the forced..i don't know.. Story/plot build? and it just kinda leads up to.. Nothing. Dude tries to find mom while with his band of misfits. It's just so all over the place I have no idea what it's trying to be. OK, this review is based only on episode 1 and that is as far as I intend to watch. In the very opening scene, the main character revs the engine and the speedometer is hanging around 300KPH, with exciting fast pace music and sirens in the background. Sweet, we're in for an epic car chase scene right? Wrong. The camera moves to a shot looking inside the car looking as though you are a fly on the windshield and what do you see? You see the shadows of street lights moving across the driver, they take about 1-2 seconds to clear the distance from the windshield over the driver, that's like 3 feet, maybe 4. Going 300KPH that shadow should be clearing 273 feet every second. So giving them 4 feet in 1 second they are off by a factor of more than 50. Suffices to say that for every different angle they look at the car from, the car appears to be moving at drastically different speeds. Okay, so the animation is off, but maybe the plot makes up for it. Maybe it would, if characters acted in ways that made sense. Right before this car chase ends, the driver hands his passenger a bag full of money and grenades as they go into a tunnel, now a sensible person would throw the grenades at the police, but she throws a bunch of the money too...because reasons. In the next scene, you see some of the main characters sitting around listening to a news story. Apparently the company that developed the drug that cured the global pandemic that prevented people from sleeping (which would have at least decimated the human population if not caused extinction) should be punished because the drug has a side effect in some minority of patients of causing them to become bloodivores. So our heroes go rob a bank, while wearing masks that cover their eyes to conceal their identity, but they talk to each other using their real names. The main character shows off his ub3r 1337 H4x0r skillz to break into the vault. He and the girl go into the vault, and while she's filling the bag with money he goes through the contents of some safe deposit boxes (probably his real goal). So she gets the exact amount of money they're trying to steal ( though it never looked like she was counting it) and they decide to go, but don't zip up the bag (maybe they thought it would be uncomfortable for the money without air flow). They run down a hall and some of the money falls out. The genius of the group stops to pick up the money and removes his mask.... because reasons. So a confused little boy comes out of the bathroom and sees him without his mask. Skip forward a bit and we see that these scenes were leading to the car chase scene from the beginning which makes it make even less sense that the girl threw the money. Skip to the end of the episode, and the cops are transporting our heroes to a prison facility, when they stop and 3 cops open the back door and open fire on them, but it's not just three, there are a bunch of cops on each side firing through the sides of the vehicles. So instead of going to a secure facility and executing them there, they're going to execute them on the street via circular firing squad while destroying their transport vehicle... because reasons. Well at least that's a great cliffhanger right? Wrong, they show a next week preview with everyone at a new prison facility and quite alive. Well I choose to ignore the next week preview. This series ended with episode 1 with all the main characters dead, and that's how I'm leaving it. So who knows, maybe this will get better and all the bizarre actions will make perfect sense, but I doubt it. After 5 episodes, the series only gets worse. Ok. I'm usually REALLY open-minded about how an anime can be made. I can understand that I might not like something about it, but in the case of this series... It's utterly bad and I means... in every way. The animation quality is average at best. It's not "bad", but you will notice, in EVERY episode, some really awkward animation or setups. They really must have cut corners in this series. The sound is average. Nothing really good either. Everything about the audio of this series is forgettable. Scenario is what made me give it 2 stars instead of none. It's an relatively standard yet a bit creative scenario. If you REALLY want a series about something alike to vampire in modern society and have finished EVERYTHING else, you might be able to appreciate this one while turning off your brain... but I still can't remember one vampire series (anime) that is as bad as this one. Not one. I strongly suggest starting with Episode 2, and not watching episode 1 at all. Episode 2 establishes the main character and primary supporting characters, their feelings towards one another, and the setting significance (nobility) of the main character. It also establishes the setting to an appropriate degree. It does all of this while presenting a splendid departure from auspiciousness and scenes that put the main characters in actual tension and trouble. The first episode is, as many of the reviewers have written, significantly disappointing. It makes the main character out to be easily dislikeable, with few noble qualities or amiable personality traits. When bad things happen to him, its hard to care. The problem with this series so far: Episode 1. Just start on Episode 2, and go back and watch episode 1 if later in the series there is a character brought in where they are treating it like you should know who they are (though they do a good job of introducing characters into scenes, so I doubt this will be much of a problem). Also go back and watch episode 1 after you have finished the series, so that you will have seen the whole series. If this series never released episode 1, I would have rated it at four stars based on episode 2. Ugh what a lazy setup. Almost everything about this episode felt lazy. From the plot to the animation to the characters. The episode started poorly and only went downhill from there. I can forgive poor animation if the characters and plot are good but unfortunately there was nothing to bolster it. The characters were bland, being archetypal tropes. The plot was lazy and felt like it was only there to setup what was teased at the end. I'll give it another episode but if the trend continues I shall not be continuing. 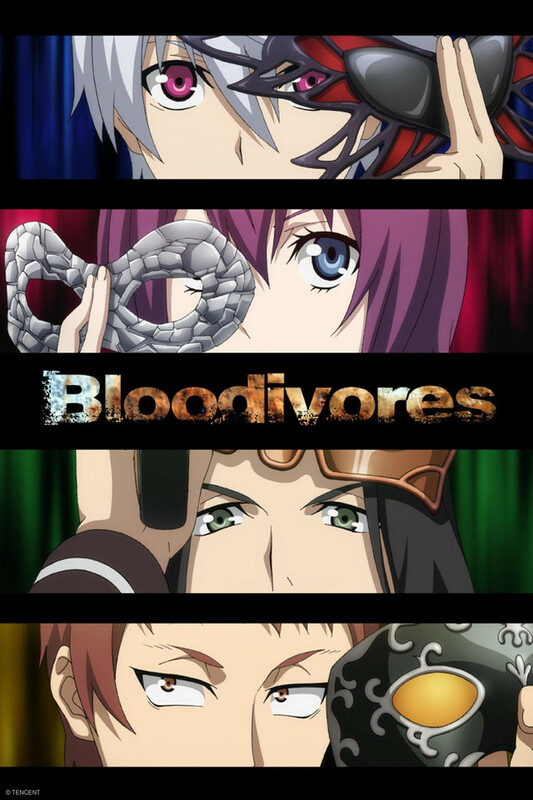 They may call them bloodivores but this is another vampire series. I could only manage 2.5 episodes before it was too much. Plot had a decent hook in the first episode, but what really turned me off was when the animation started cutting corners. Dialogue sequences tended toward using as few different frames as possible and action scenes were pretty meh. Good start to an iffy anime? With two episodes in, it looks like a unique "vampire" spin off, only with teenager, a sort of Btoom or Deadman Wonderland esque event. The story doesn't rush too terribly much, and it has a lot of dramatic tension, but it is engulfing and hard to tear your eyes away. The only issues I'd have are the minor animation details (mainly shadows) that are off, but who cares, we all watched anime in the 90's, and the main character goes from laid back and chill, to a "oh my god" way too fast. Continuity errors spanning episode to episode that i had to look back to make sense of it and couldn't find anything. Characters are obnoxious and useless. Story made no sense and seemed like they tried to stretch an episode out for an entire season. Ending was complete bs and didn't have any sound resolution. It was as if you are 3 episodes in and then the animators just gave up. The low ratings are inaccurate! The story is truly interesting. There's a mystery in every corner. Yes, it's the typical super power anime. However, if you take the time to watch each episode carefully, there is a truly interesting plot that I highly recommend to see. Not only does it have mystery, but it also has a great amount of action and romance.